Watch The Interview cheaply on Amazon. You too can earn money from writing articles by signing up for InfoBarrel. The Interview opens with a young North Korean girl singing a song with subtitles (the essence of which could probably be boiled down to "Die, America, Die") as a rocket launches behind her. North Korea now, apparently, has built a rocket capable of reaching the entire western seaboard of the United States. 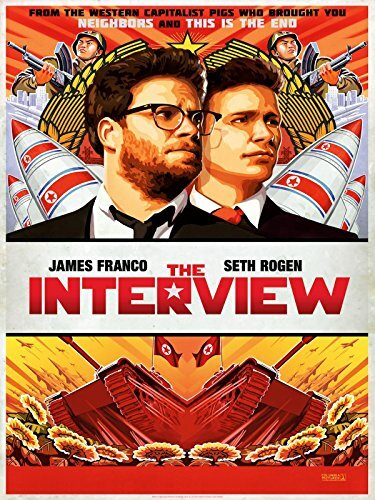 Credit: https://en.wikipedia.org/wiki/The_Interview_%282014_film%29#mediaviewer/File:The_Interview_2014_poster.jpgDave Skylark (James Franco, Homefront, Oz The Great and Powerful, This is the End, Your Highness) is the host of Skylark Tonight, a celebrity "news" show that is not exactly high-brow entertainment (there are cameo appearances by a number of stars as themselves on it). He, and his producer Aaron Rapaport (Seth Rogen, Bad Neighbours, Bad Neighbours 2), are celebrating 1,000 episodes. Aaron, however, is feeling a bit down about the shows they are currently doing, and wants to do something a bit more serious - which is where Dave comes up with a "brilliant" plan. Dave has discovered that Kim Jong-un (Randall Park), the President of North Korea, is a big fan of his show. So he suggests they do an interview with him as, given the current tensions, you can't really do an interview much more serious than that. After a bit of effort, which involves a trip to China, Aaron meets a representative of the country, Sook Yung Park (Diana Bang), who says that the Supreme Leader would be pleased to do an interview, under certain conditions, for Skylark Tonight. In North Korea. Which is where the CIA steps in in the form of Agent Lacey (Lizzy Caplan). She wants Dave to shake Kim's hand and poison him. Dave, being basically a complete idiot, fancies something more out of James Bond. Aaron, being a little more realistic, thinks that the original plan is better. So, off to North Korea they head, to try and assassinate its leader. They meet Kim in his home - which seems to owe its design to Albert Speer and 30s Germany, where the interview will be shot. There was more than a bit of controversy over this film. The Democratic People's Republic of North Korea - or at least, the probably very tiny percentage of the country that actually saw it, never mind know it exists - did not take it well, accusing the US of inciting terrorism. Sony Pictures Entertainment was hacked, possibly by the country, and threats made to movie-goers resulted in its release being pushed back and it getting a much more limited showing at cinemas than originally planned, with The Interview consequently failing to perform as well commercially as it might at the cinema, although it has done well from rentals and internet streaming. Dictators of countries are often not known for their sense of humour. There is a lot of bad language, some sexual references and violence with not-always-realistic - but sometimes icky - gore - which is not actually that unusual for a film featuring Rogen and Franco. There is some genuine humour too, such as Kim and Dave tooling around in a 20th century Soviet-era tank whilst listening to Katy Perry. It's not for the easily offended though. Such as dictators. The Interview is an action comedy film that is better than you might think, which is mostly carried by the performances of the two lead actors - even if you occasionally want to give Dave Skylark a smack. To my mind it is not a great movie at all. Surprisingly, I enjoyed it. I wasn't actually expecting to.